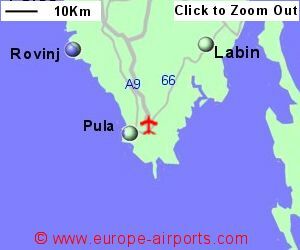 Find and compare the best prices from a range of well known car rental companies at Pula Airport. This is a free to use facility, enabeling you to book direct with the company quoting the price. A shuttle bus service exists (not every day) between the airport and Pula at a cost of around 30 Kuna (approximately 4 pounds), and taxis are available. The airport has 2 cafe/bars, a duty free shop and a VIP lounge, catering for "Jet Set" guests with private planes heading for Brijuni Island as well as regular tourists heading for the resorts. Pula airport handled 595,000 passengers in 2017, an increase of 36% compared to the previous year.